I was in the Barstow area to do a hike with a friend on New Year's eve and spent the day doing some embarassingly easy summits as a warm up. Having driven in from San Jose the previous evening, I found the outside temperature at 18F when I got up around 6:45a. I knew it was supposed to be cold, but that was almost ten degrees colder than the forecast I had used. Fortunately there was no wind and a pair of gloves and balaclava were all I needed to accessorize my fleece and standard hiking kit. Found northwest of Hinkley, Lynx Cat can be reached via a wide, well-graded dirt road that leads to a sand quarry on its southwest side. A BLM road branches north just as the road turns right to enter the quarry property. I used a large clearing adjacent to the BLM road and quarry to spend the night undisturbed. In the morning I spent about 20min to reach the summit and about 15min for the return. 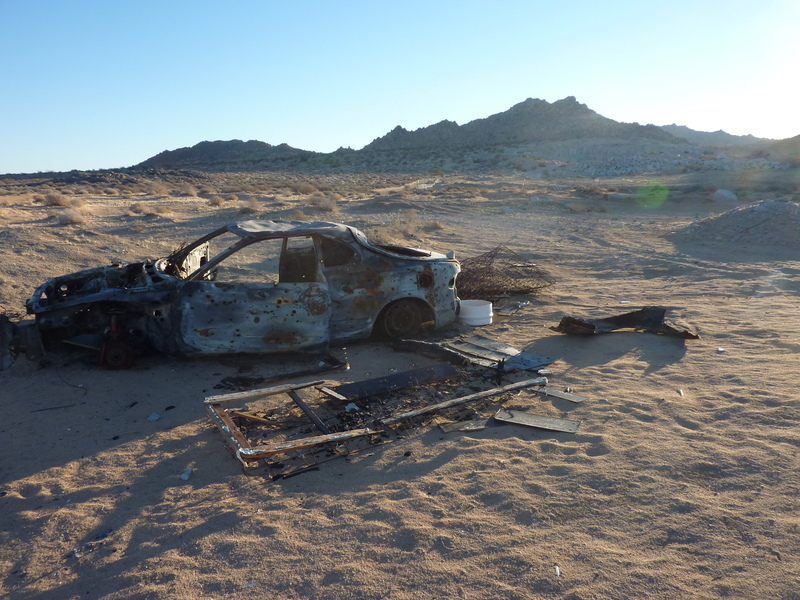 The area is an unregulated OHV/ shooting area that really makes one appreciate the 1994 Desert Protection Act. Hinkley is a diminutive community in a slow state of decay and abandonment that makes Barstow look downright metropolitan. Not much to recommend this (other the other summits on the day). This tiny summit with little prominence is found just behind the CLUI Desert Research Center off Hinkley Rd. The name is far more impressive than either the unremarkable research center or Red Hill. Some dirt roads off paved Hinkley Rd can be used to make the hike to the summit less than 10min. I felt shame. This unnamed summit lies roughly between Lynx Cat and Red Hill. It sports 330ft of prominence so I paid it a visit. Like Red Hill, it can be accessed off Hinkley Rd. An abandoned ranch site on the east side of the peak can be used to shorten the hike to the summit to about 20min. Lots of off-roading, shooting and trash dumping in this area as well. Not sure how this got the "Mount" designation, but it's really just another volcanic plug sticking up from the desert floor, this one northeast of Hinkley. A trio of dogs from a home at the end of Dixie Rd were not so friendly and prevented me from starting my hike from there. Another dirt road heading east worked nicely afer a quarter mile when the dogs gave up and returned home. I hiked north up a wash that doubles as a BLM route, though only a Jeep or equivalent can negotiate the difficulties encountered. It took about 30min to reach the summit where I found the only register on the day. A day in the desert isn't a success until one finds a Gordon/Barbara register. This modest summit is a foot shy of the "ranked" prominence value of 300ft. It is located east of SR247 south of Barstow and just behind the Barstow landfill. Less trash on this one, but there are OHV tracks on many ridges, in the washes and over the summit. These last two summits are located in the Stoddard Wells OHV area which have trails going all over the place. The hike takes about 30min roundtrip. I used the dirt Stoddard Wells Rd off SR247 to access this last summit from the west, near where the good dirt road goes over a saddle before dropping into Stoddard Valley. I came across a trio of young motorcyclists enjoying the day, seemingly having much of the surrounding area to themselves. This was the most interesting of the day's summits, mostly because it wasn't quite so short. Still, the roundtrip time was less than an hour. More shame.